During November 2015, the 60 meter station was put together, awaiting the permissions for 60 meter to become valid. On 60 meters, I am using up to 100 Watts on SSB or CW. With digital modes (mainly JT-65 or JT-9), the power is mostly reduced to 50 Watts, avoiding stress to the equipment. Note: On April 1st 2017, our allocation was reduced to the WRC 15/15 allocation (15 kHz/15W). Recently, I rearranged a home made QRP transceiver for 5 MHz, but this project needs a bit more time. When conditions permit, just a few Watts are sufficient to make a QSO, especially with weak signal modes like JT65 or JT9. Most WSPR beacons (see wsprnet.org and select 60 meters) operate with less than 5 Watts. I have seen numerous spots with distances well above 15,000 km. The 60 meter antenna is an inverted V dipole (full length), the top is nearly 10 meters above ground, the legs sloping down to about 7 meters AGL. A MFJ fibreglass mast is mounted at the wall, with a tilt mount. Ropes with pulleys hold the mast against a wooden block on the wall. Very simple, but effective. The dipole is fed via a balun, better known as “ugly balun” (more info: here). This is a coil of coax, wound around a PVC pipe. The bottom end has a smaller cap, glued into the larger one, to keep the connector dry. At the top, the inner conductor and shield of the coax are connected to the red and black wire via screws that pass though the PVC pipe. It is important to keep the capacity between antenna side and feeder as low as possible, so keep the balun away from conducting surfaces. Man made noise (see article) is a serious problem for many of us and unfortunately, this is true at my location. Two of the worst sources I suspect are a TV set that is causing S9 noise and a solar panel system which causes 50 Hertz spike noise (similar to power line noise). I tried to reduce it by installing a reflector behind the dipole, with a relay in the centre, to switch it on or off. It helps a bit, but not completely. Next to the dipole, further away from the noise sources, I put up a vertical, but this was not successful. It picks up much more man made noise and when checking my signal on web SDR receivers, it does not outperform the dipole when transmitting. My guess is that the vertical receives the noise and reflects it back to the dipole with 180 degrees phase difference and the right amplitude to cancel the noise out. This works better than any separate receiving antenna that I tried, like loops, terminated loops and the like. With the start of the sporadic-E season, I wanted to put up an antenna for 6 meters. The fibreglass mast restricts the permissible load, so I took a part of the 6 element yagi and turned that into a 3 element beam. I wanted to reduce the wind load from the 60 meter dipole, so I chose a Diamond 1:1 balun and thinner wire, which was used for army telephone lines, with steel and copper wire in it. It weighs next to nothing. On 6 meters, the Chinese electronic crap is loudly audible. Wideband noise, power line like noise and impulse trains from a power line transmission system about 100 metres away are disgusting examples, indicating that the European EMC directives are way too lenient. Remember that the distance to the suspected sources is well over 30 meters! 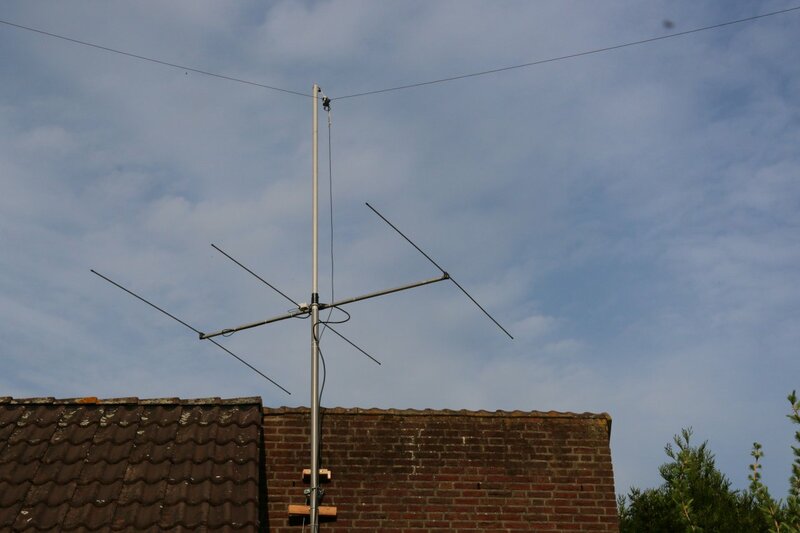 The first weekend of July, I finished my 4 meters transverter. My good old 6 meters transverter, originally built in 1987, was just gathering dust. Not without emotions, though, because I worked about 146 entities with it. The modification took a couple of evenings and it passes the tests, so to say. Some tweaking has to be done, but QRV on 4! Output about 5 Watts, antenna is a 3 element yagi. This is the antenna setup (the 6 meter yagi is longer now, but still too low). PA2S Antenna July 2016 – Top to bottom: 60 meter dipole, 70 MHz 3 el. and 50 MHz 4 el. yagi. As long as amateur radio blood flows, it will put pressure on the performance of the station… thus a little tower was acquired and modified. 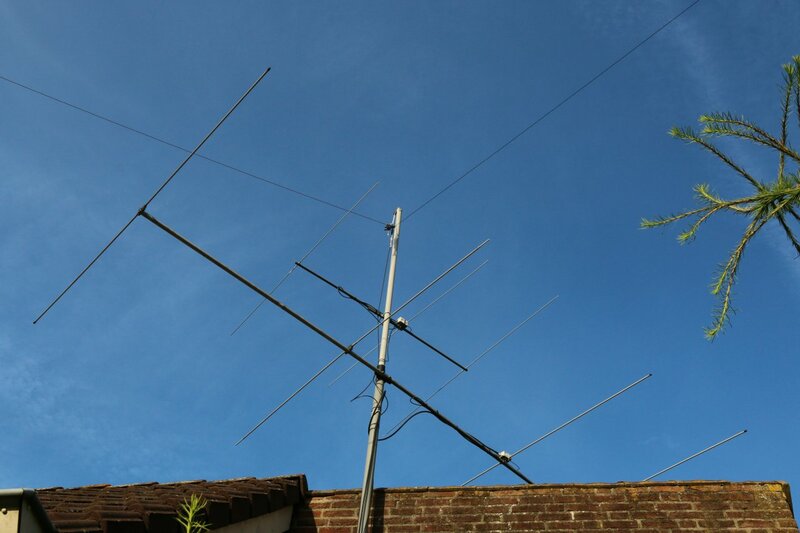 The 4 meter antenna was changed from 3 to 4 elements, boom length is about 2.8 m. It performs noticeably better than the 3 elements, which I did not expect, as the difference in gain is small. Apparently, the overall noise level is somewhat lower because of the improved directivity. Of course, the added height helps a bit as well. I can now hear the LX1FOUR beacon 24/7. Usually weak, but always there. During August, the PA for 70 MHz was put into service, increasing power output with roughly 10 dB. It was nice to be able to work a couple of new ones during the Perseids meteor shower. 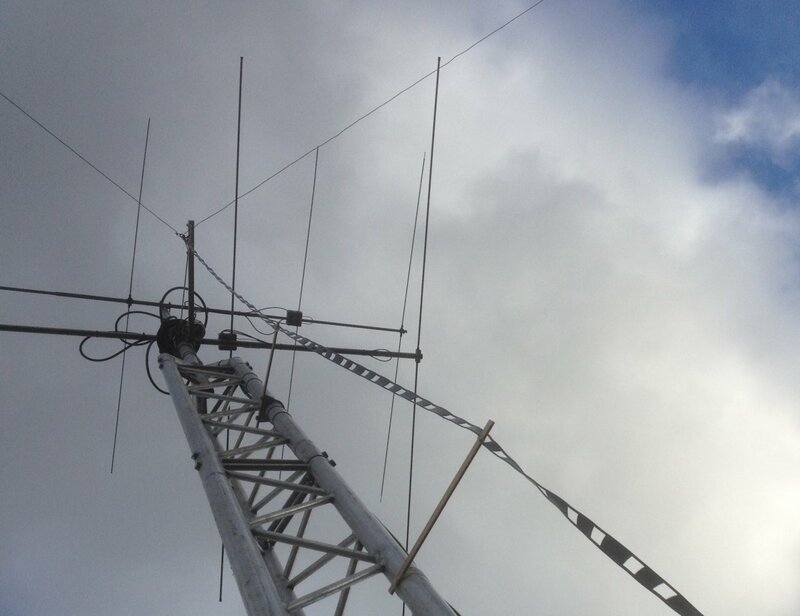 In September, the 6 meter antenna was taken down and replaced with a small yagi for 70 cm. 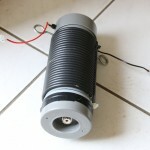 I will try to fix my transverter for 70 cm and may take part in the October UHF contest. The 70 cm contest was not really a success, because of the low activity. Here is a write-up: 70 cm contest 2016. 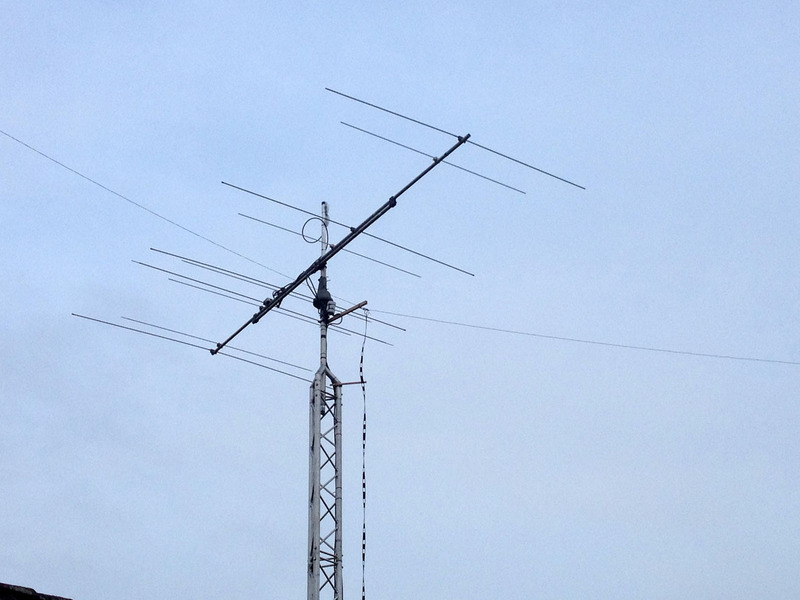 After the contest, the 70 cm antenna was replaced with a 3 elements yagi for 6 m, the “winter version”. Some meteor scatter QSOs were made. 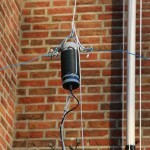 The latest modification is the replacement of the 60 m dipole. I was looking for a multiband solution. After quite a bit of reading, I decided to make a doublet with a balanced feeder and tuner. It was used during the 2016 CQWW CW contest and it worked very well. Nearly 100 DXCC entities worked with 100 Watts. On 60 m, the performance of the doublet seems to be a tad better than the dipole. The tuner is an old TenTec 229B tuner. I had to replace the fixed capacitors, because they were unstable. I found Russian doorknob capacitors with 12 kV rating and now it is rock solid. A separate article shows the modification. The front panel lighting was replaced as well, it now has contemporary LED lighting (without noise, being fed from a 12 V linear power supply). The antennas for 6 and 4 metres were taken down during the winter period. 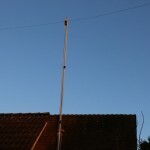 The 4 metre antenna was put together rather hasty and needed an upgrade anyway. Some articles about dual band 6/4 metre antennas inspired me to have a closer look. One of the reported drawbacks of dual band antennas is the vertical radiation pattern. Often, only horizontal diagrams are considered, but these days, man made noise poses a serious problem. Most of the designs I came across, suffered from bad vertical side lobes. I was just about to give up when I stumbled upon the YU7EF design, which had a better pattern. So I decided to put it together. A separate article reports about the antenna. It is difficult to judge how it performs in real terms, but the first impressions are positive. 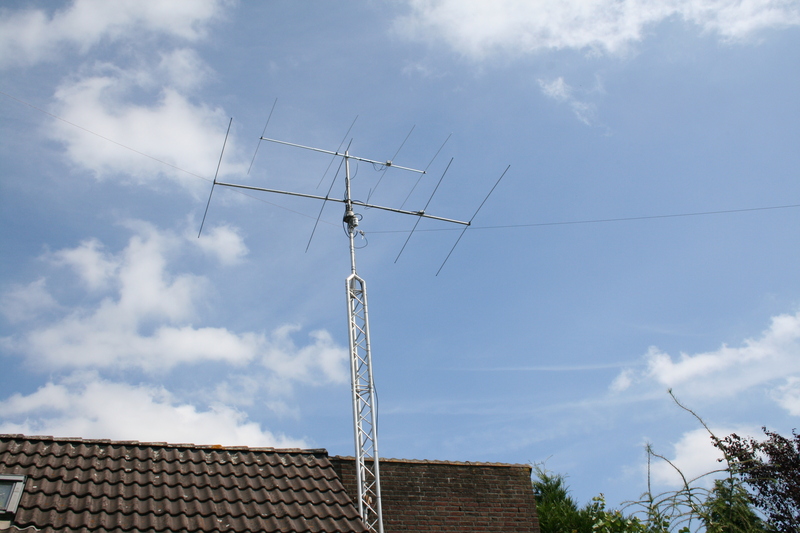 A comparison with a Tonna is planned and I also intend to compare it with the former 4 metre yagi.